We have just received the exciting news that our Garden Venue is now licensed for Wedding Ceremonies! Bringing the outside in, or is it taking the inside out? Either way, all our couples now have the choice of a ceremony with an “indoor outdoor” style when the weather is not so great. With views across the Arbour Lawn, Garden Meadow and over to Berry Tor, your guests will see all that is romantic about being married in the Cornish countryside, from the inside! 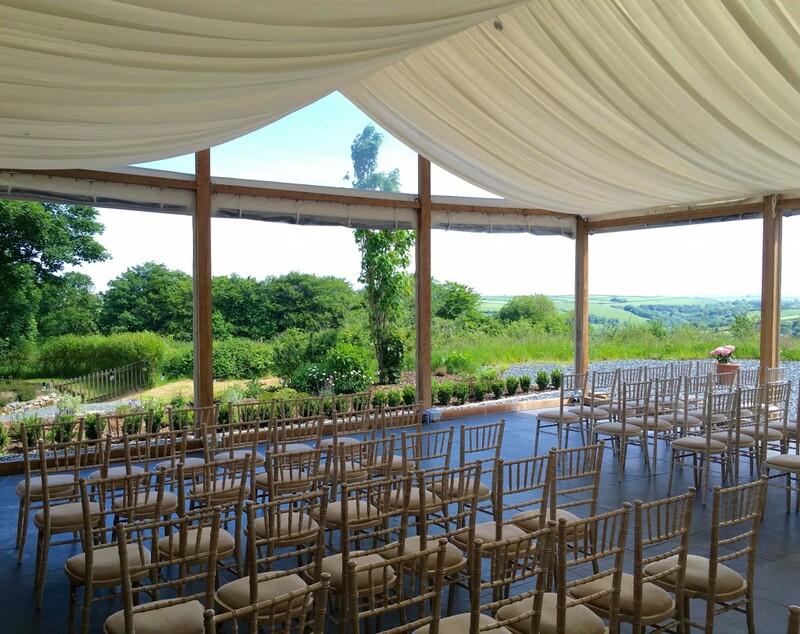 With this run of good weather in Cornwall, all our recent ceremonies have been held under the new Arbour. However, here are a few iphone snaps of our Lime wash Chairs laid out for a Garden Venue Ceremony – just add flowers, guests & a couple! 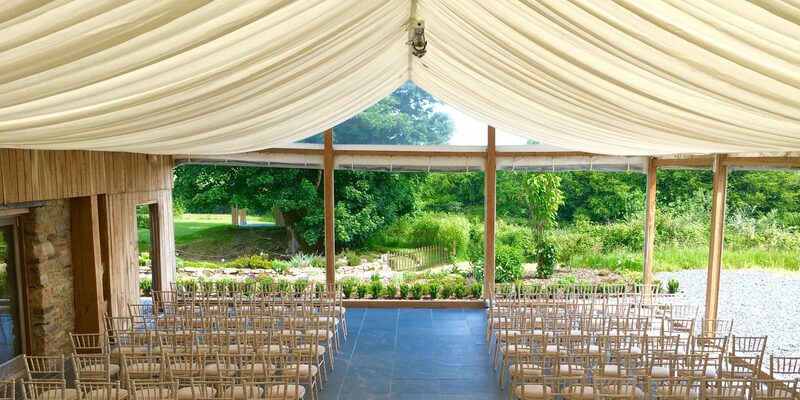 Its easy to see what a wonderful ceremony space this will be all year round. A blank canvas for your wedding style. The Garden Venue space comfortably seats 120 guests with a wide aisle for our Brides, the Bridesmaids and their dresses! During the winter months the Garden Venue mood lighting will add another dimension. The soft ceiling drapes are full of fairy lights which will twinkle above the couple as they say their vows. The colour changeable up-lighters provide a warm pastel glow with pin spots high lighting floral decorations. The Garden Venue is fitted with a surround sound system for ceremony music (and microphone if desired although not required). 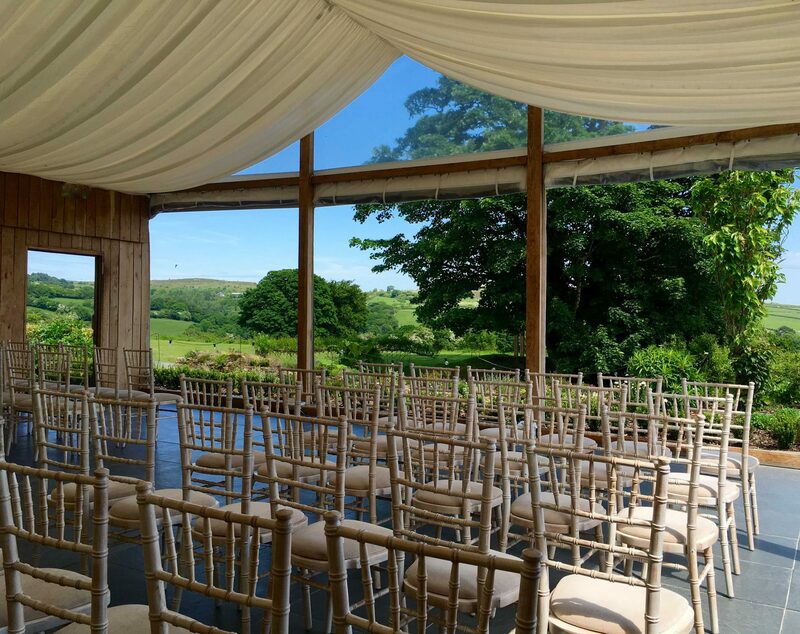 On days when the weather is unpredictable, neither absolutely dry for an outdoor Arbour Ceremony or neither too wet for a definite indoor Garden Venue Ceremony, Team Trevenna will set up both ceremonies allowing a last minute decision on where the ceremony will actually take place! The following locations now licensed for Ceremonies at Trevenna include the Threshing Barn, Garden Venue, Shippon Barn, Farm House and outside under the new Arbour.